– In November, a seven-year-old girl was raped and murdered by two brothers. – In November, a woman was allegedly raped by 10 men at a hotel in Defence Housing Authority (DHA), Karachi. – In October, a middle-aged widow was raped by a staff member of the hospital where she was being treated. – In October, a 16-year-old in Dera Ismail Khan was stripped and forced to parade naked as punishment for her brother’s crimes. – In September, a 16-year-old domestic aide was raped and tortured by five members of the employing family. – In September, a teenage housemaid was found tortured to death by her employers in DHA, Karachi. – In July, a 17-year-old girl was ordered to be revenge raped by a village panchayat for her brother’s crimes. – In May, a deaf, mute woman was raped on a train when she went to the washroom. – In February, a young girl was shot inside her house by her brother, in the name of honour. – In January, a woman burnt her 18-year-old daughter alive for eloping with a man. No matter how old, how modest, or how independent the woman is, she is unsafe. Hence, it’s not surprising to find out that out of 153 countries, Pakistan was recently ranked the fourth worst country in the world for women. The ranking revealed Pakistan to have the highest discrimination in the world against women, as well as the lowest financial inclusion. Yet, not only do these village councils (declared unconstitutional by the Supreme Court) continue to dole out ‘punishments’, but women like Mukhtaran Mai, who choose to speak of the crimes committed against them, are maligned and ostracised by the society. After all, who can bear to look at their own sins in the eye? Now, people frequently choose to dress or behave a certain way, but women are made a promise. ‘Just wear your long shirt and you won’t be gawked at’ – so we do, and we wrap our shawls a little tighter, and cover our faces and our eyes, until we are reduced to formless black shadows. Yet we never feel safe, as we are cat-called and harassed regardless. So we stop leaving the house altogether, and thereby create public spaces where men feel more and more entitled to develop unbridled power. Is it any wonder, then, that the White Ribbon Society of Pakistan reports 4,734 cases of sexual assault, 15,222 cases of ‘honour’ crimes, 1,843 cases of domestic violence, and 1,535 cases of women being burnt over the past few years? This false promise of safety in return for compliance is a double-edged sword – a noose placed lovingly around our necks and tightened year by year. We leave our jobs and lose our financial independence. 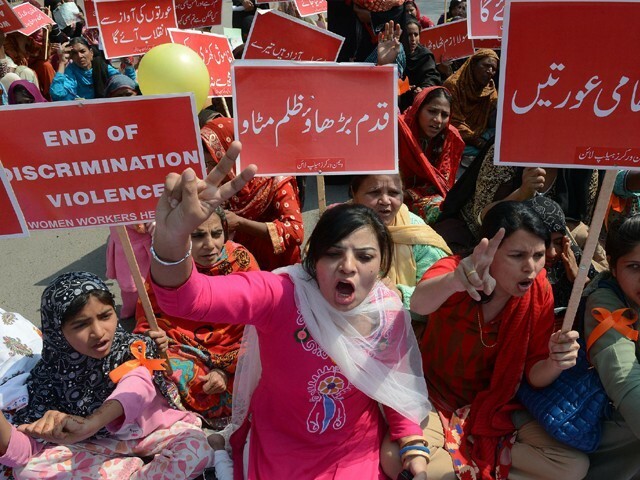 When four out of five Pakistani women face domestic violence, it is already too late. But think of what people will say, beta – their good opinion must be maintained at the cost of your dignity. Think about the children, beta – who would rather fester in conflict than live outside the circumscriptions of society. How will you support yourself, beta – because you already gave up the job we told you to give up since we thought it would improve your marriage. So we listen. We compromise. We bend over backwards, but there is always something more the woman can do, you see. You can suffer a little more. You can always be a little more invisible, a little quieter, and perhaps when you are dead and cold you will finally be a good girl and no one will bother you anymore. Every bruise on our body is glorified as if it were a badge of honour. In fact, women’s bodies have become the playground for men’s desires, and the battleground for their ‘honour’. A 2015 report published by the Human Rights Commission of Pakistan (HRCP) found domestic disputes, (alleged) illicit relations, and exercising the right of choice in marriage to be the predominant causes for violence against women. In June 2012, two sisters were shot and killed in their sleep by their cousins in the name of honour. In 2014, a woman was stoned to death outside the Lahore High Court by her father and brother for the crime of marrying the man she loved. The fact that women can be killed for holding an opinion or making a choice, the fact that so many of these crimes are committed by relatives, highlights the extent to which we have been dehumanised. You see, the promise does not hold, and the dictum does not deliver. You can be as uninvolved as the innocent women mentioned above, or as iconoclastic as Sharmeen Obaid Chinoy or Malala Yousafzai. If compliance and noncompliance have the same outcome – suffering – then there is neither logic nor purpose in our unending sacrifice and silence. If the choices women are offered are between bad and worse, we ought to stop playing the game altogether. I say this to myself, as a young woman. I say this to other young women, as well as young men. The women of Pakistan are equal citizens of this country; worthy of equal rights, dignity, protection and opportunities. Cheering from the side-lines will not suffice – get involved. If we are to suffer either way, let us suffer together for our sisters, for the generations ahead of us, and the future of this country we call home. Join a protest, go out for tea with the amazing Girls at Dhabas, support Sahil’s counselling services for victims of sexual assault, begin the conversation with your peers and your families. Most importantly, begin the conversation with yourself. Know, and be sure, that you, just as any other human being, have the right to live free and unafraid. The author is a Fulbright scholar, currently completing her Master's degree in Mental Health Counseling from Boston College in the US. She has previously served as the Senior Manager for Research at Rabtt, a social enterprise which works to foster empathy and critical thinking through educational programs.